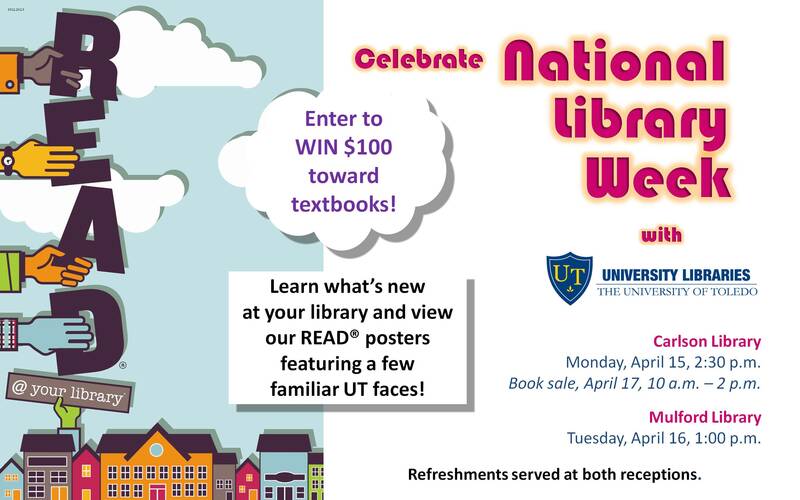 Join the University of Toledo Libraries in celebrating National Library Week next week, April 15-21. We will be hosting two receptions to unveil our new READ posters, featuring some familiar faces from the UT community with their favorite books. The receptions will also give you a chance to hear about some of the newest initiatives from the libraries, and we will be giving away a $100 gift card to the UT Bookstore to help you buy next semester’s textbooks (Separate drawings at each library; must be present to win). Refreshments will be provided at both receptions. Carlson Library, Monday April 15 at 2:30 p.m.
Mulford Library, Tuesday April 16 at 1:00 p.m.
On Wednesday, April 17th, the UT Libraries will have a used book sale in the Carlson Library concourse. Stop by between 10 a.m. and 2 p.m. to look for some great deals!